Yessiree.....that's a sock on my foot!!! I would like to think that the stripes going around is what is making my foot look incredibly wide....but alas....I have a wide foot....triple E width....so WHAT THE HECK was I thinking with this self striping yarn!! Gee....wonder if I can knit a sock with the stripes going up and down rather than round and round??!! LOL!!! Must admit this sock was WAYYYY easier than my first attempts....helps when you know what you are doing!! LOL!! 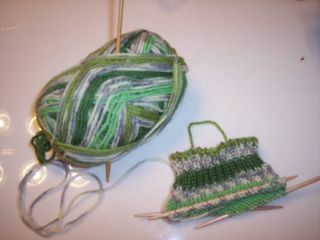 I love working with the self striping yarn....it is so much fun to watch the pattern emerge! This sock only has a couple of small issues....this yarn was so bad to separate and there are a couple of spots with the yarn looks pulled from not getting the entire loop on the needle....and a place or two where despite tugging hard the stich still looks loose.....but I'm not going to rip it out because of that! I blame part yarn and part just needing a bit more practice with my joining. I made these on # 3 dp needles and want to learn to use circs. I hope to set up a "knit date" with Tonni soon and see if she can help me with this.....oh...by the way Tonni....I'll be emailing soon! LOL! Hope to finish the mate this week.....lot's of work to do this week so we'll see how much I get accomplished!! Yes I do realize it is Monday and I am just now posting my Saturday Blue Sky Entry!! It was a busy Saturday! I went out of town Saturday and didn't get home till late....then Sunday was...well...a busy Sunday...and here it is Monday! 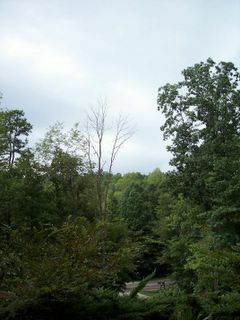 This pic was made from my yard...sky doesn't look too impressive but it DID rain later in the day!! YES....finally some much needed rain!!!! 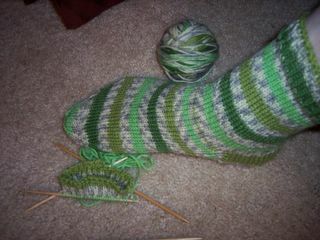 Yes Indeedy....I am workin on another sock.....this one is a real live, genuine adult size sock!!! Feeling OH so much better with this one....although the first row isn't as nice and tidy as I would like at least I HAVE a first row!! LOL!! Did you notice the one long needle? That would be the 7" replacement needle for the 5" needle that Max chewed up!! So that makes three 5" needles and one 7" needle.....I never do anything the easy way!! Ha! Ha! Have a busy weekend ahead....hope to have some time to work on this little jewel this weekend.....remember many posts ago where my DH was giving me such a hard time about making socks????? WELL.....this just MAY be the socks I make for him.....to wear to work......because he is such a Darling Husband.....but mainly because he is colorblind and it is time for PAYBACK!!! LOL!!!! Come to think of it I have the same yarn in a LOVELY pink/purple combo that I bought with Princess Cupcake in mind......ohhh....have to think on this situation!! LOL!!!! It's Another One...Sort Of Like The Other One!! O.K. I am done with the mini socks! One is going to be a Christmas Ornament...the other one I'm going to stuff with cat nip and drive Gracie Kitty even crazier (if that is possible)! I follow Marguerites' blog, Stitches of Violet http://stitchesofviolet.blogspot.com/. Marguerite participates in a project called CIC (Children in Common) http://www.childrenincommon.org/ . 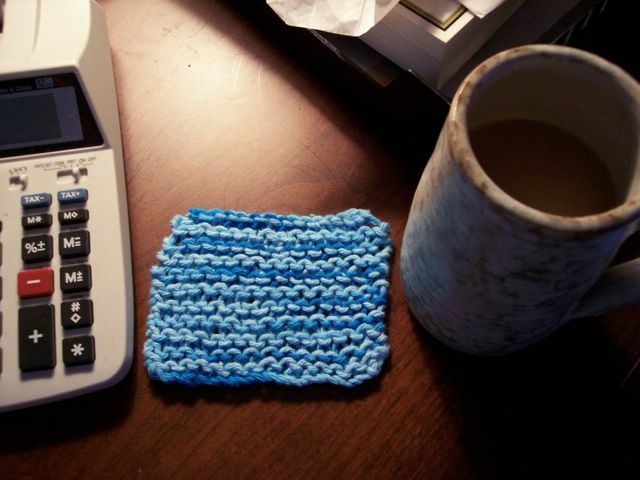 In a nutshell, this is a project where knitters can donate socks, etc. to be sent to Russian orphanages. 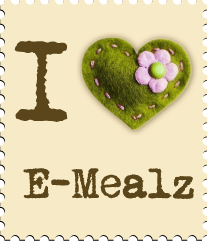 Take a look at Marguerite's website....she has made SO many beautiful children's socks! 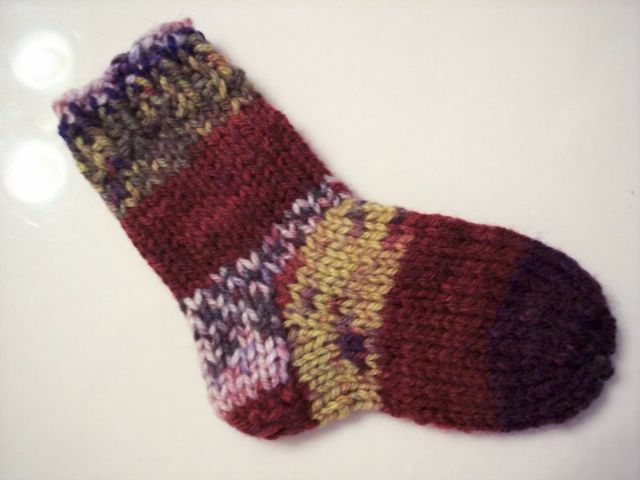 I think this is a great project to contribute to and I am waiting on instructions for a basic children's sock pattern so I can start working on my contribution. The mini socks knit up so fast and fun to make I think the children's socks will be as enjoyable to knit and best of all will be donated for such a wonderful cause!! It's a MINI sock!!! YIPPEE!!! 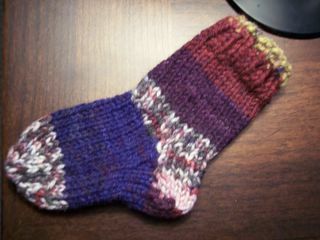 I am working on a "mini-mate" for this one....then I'll jump back on making a pair of regular size socks. I'm thinking a pair of these little "mini's" will make cute Christmas Tree ornaments! Got to work a bit on the top where I join...seems like no matter how tight I pull I still have that little gap....but hey....I'm just proud to be able to make this little fella.....maybe there IS hope for me making socks!!! Can you guess what kind of cake this is??? 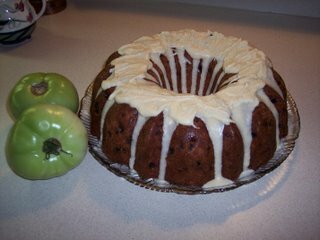 This is a GREEN TOMATO cake....and yes it does have green tomatoes in the it, 2.5 cups to be exact!! I found the recipe in the Paula Dean magazine and couldn't resist making this for my Dad's birthday cake!! Pretty tasty too!! We spent the day celebrating my Dad's birthday...played some dominoes (Dad won by 5 points)!! Enjoyed a good visit with everyone, including my cousin's sweet little daughter!! 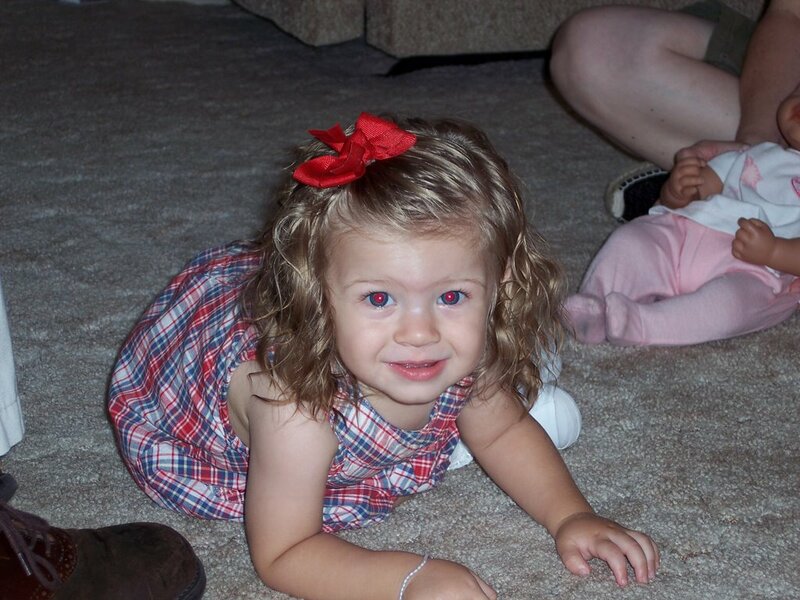 Have you seen a cuter little girl????? My Saturday Blue Sky was an overcast, rainy one for the better part of the day! Which we needed badly!! We live on wooded property and so many of the really big, old trees are showing signs of distress from all the heat and lack of rain!!! Also been baking today....I'll have to post a pic of the cake I am baking for my Dad's birthday tomorrow. 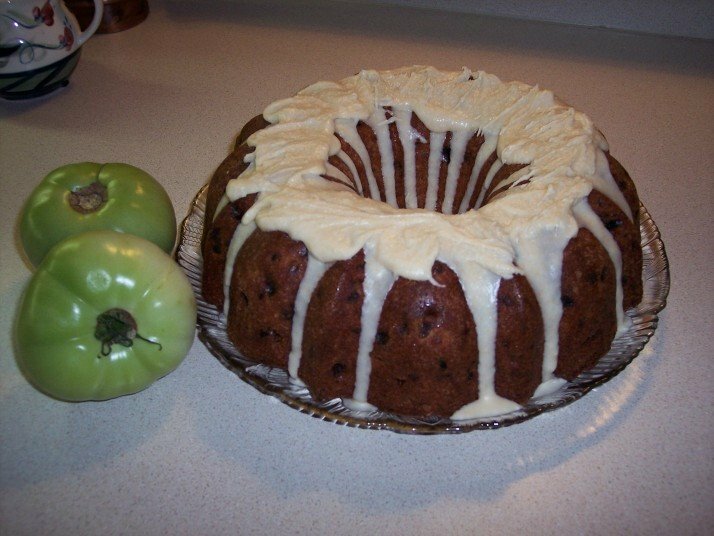 Have you ever heard of a GREEN TOMATO CAKE???????? YUM! YUM? YUM! 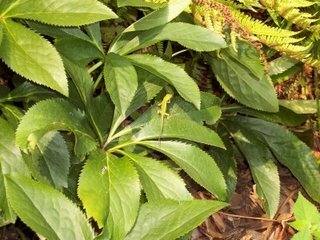 It has been my understanding that Gracie's Summer project has been to rid the world of Lizards.....testament to the fact of the many complete and assorted lizard parts that have been deposited on the death mat (formerly known as the welcome mat)! This little fella somehow seems to have missed the "jaws of death" (Although Gracie could just be letting him grow to a more "fun" size)! The little fella doesn't look TOO tiny but this is a ZOOM, ZOOM, ZOOM pic.....he is T.I.N.Y....don't think I have ever seen one this tiny!! Hope he makes it!! I think I am tired of "warshrags"......I have made over 2 dozen, most of them a different pattern. I was visiting Sydney ( http://www.doctordirt.com/blog/), one of my Alabama blog buddies, and saw her entry about working on a bib when it hit me......I have a cousin that lives "up north" that is having a baby in September!! 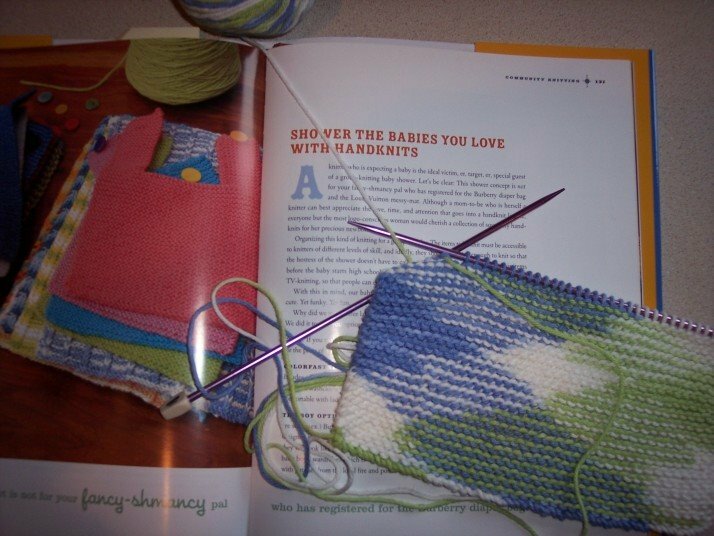 I started this bib from the MD book....I love the way the colors are patterned out!! I think I'll also make a blue bib to match this one, and move on to the Kimono (if it isn't too hard for me to complete and look presentable!) LOL!! 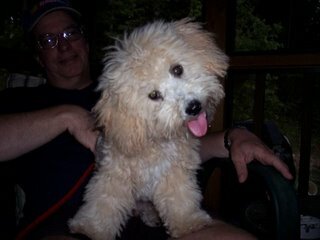 Life is back to normal in our household.....puppy Jesse was picked up by his owners, all the "intruder" paraphenalia is gone, Max has settled down and I was actually able to coax Gracie from the basement......hmmmm.....wonder how she knew the puppy was gone? Busy next few days and weekend ahead. Picking up my Princess Cupcake today! We will do some shopping today for "beanie babies" to donate to Children's Hospital. Children's Harbor (which is a support ministry for Children's Hospital, and is 100% privately funded) is a ministry that assists the families and children who have chronic, life-threatening illnesses at Children's Hospital. The ONE SINGLE THING that the children LOVE THE MOST is "THE CLAW". This is an arcade type deal where the kids put in a token and "go fishing around" for a stuffed animal with this claw thing. I figured Princess Cupcake would know better than I do which animals are the desirable ones! Chicks with Sticks meets tonight, Girl's Night out Friday night with a group of my friends, Saturday morning hope to be a Knit Nouveau when they open for a quick "fix".....also introducing Cindy (Chicks with Sticks co-founder) to KN. Bake a birthday cake for my dad then on Sunday visit my folks to celebrate my Dad's birthday!!! WHEW!!! 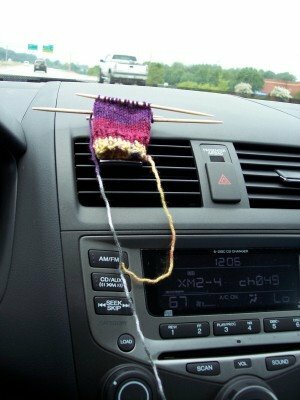 BUT.....at least I don't have to drive Sunday so I can knit.....YIPEE!!!!!! 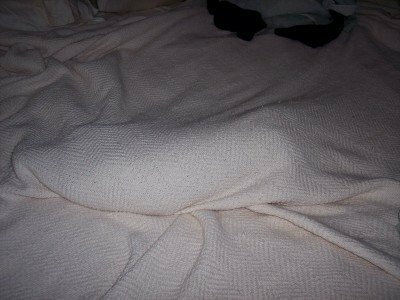 While this is an old picture of Gracie we did find her!! She was quite "shell shocked"....wandering around at the edge of the woods last night and from the looks of her that was where she had been the entire time! We picked her up and took her to the basement.....fighting all the way! When we put her down she scurried behind some plywood stacked against the wall and stayed there overnight. We could not coax her out, she didn't eat or drink anything we left for her as we checked on her multiple times last night trying to coax her out. Thankfully this morning I did see where she ate a bit of food although she is still behind the plywood. Poor thing! The puppy will be picked up tomorrow....no telling how many days it will take for her to recover enough to come in the house. I imagine when she can't detect "puppy smell" anymore she will feel safe enough to come back in! While I have no knitting to post for today I do have this! Question: When is a lump in the bed NOT a lump in the bed??? When it is your cat that is TERRIFIED of the LITTLE puppy you are babysitting!! Gracie kitty was so traumatized when little Jesse arrived she immediately dove under the covers and stayed there for about 7 hours, when she DID come out it was to run for the door....upon letting her on the porch she immediately dove THROUGH the screened door, litererally THROUGH the screened door and we haven't seen her since!!! Still not back this morning!! Max is NOT happy that Jesse is here!! He will tolerate the little one as long as he is sitting quietly....yea right....this little powerhouse is a bundle of puppy energy just waiting for a place to explode!! LOL!!! In otherwords a typical little puppy and one grumpy old dog!! No blood shed yet and we plan to keep it that way!! I guess this answers our question of whether or not Max would accept another dog in the family.....unless perhaps it is a grumpy old dog like Max so they could lay around and complain together about the cat and all the "youngster" pups in the neighborhood!! Also, my dear friend from Wetumpka came up this weekend for a visit...we try to get together at least once a quarter for an "all girll weekend"....we stay up all night talking, spend the day shopping...although it is getting harder and harder to stay up till the wee hours of the morning then get up and have a full day of shopping....not as young as we used to be!! LOL!! STILL haven't talked her into learning to knit.....despite the fact that she wanted me to make her some "warshrags"!! LOL!!! We are planning a trip to Greenville when I go to her house for our next weekend get together....the result of a small article in Southern Living magazine. Still working on some "warshrags"......working on another mini sock but I am stuck so I'll have to go back to KN for a "sock intervention"......but I am getting there!!! Almost......Ha! Ha! 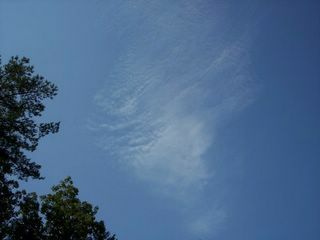 Blue Sky Saturday From Trussville today has a HINT of clouds!! I have figured if I get up early enough I can actually GET a picture of blue sky before the heat and haze set in! This shot was made early this morning from my back yard....I guess this is close as we will get to actually having a cloud in the sky! Such a small chance of rain that I doubt we'll see any. I am soooooo ready for Fall!! 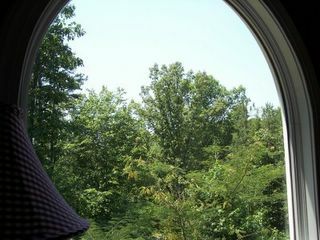 It was over 90 degrees on the porch this morning by 9:00......even the birds are too hot to come out!!! Hope everyone's Saturday Blue Sky is a good one!!!! 1. I was born in Jasper, Alabama, have always lived in Alabama. 2. I have 2 sisters....I'm the middle one. 3. I am a yo-yo dieter....always have been....(I know, I know...it's not good). 4. To quote my nephew.....food is my life!! LOL!! 5. I love to cook but frequently screw things up! 6. I love to knit...I'm not great at it but I love it!! 7. I am a registered X-ray technologist. 8. My husband fulfilled a childhood dream of mine by surprising me with a piano and lessons one christmas...and it TRULY was a surprise! 9. I hate to get dressed and put on make-up. 11. I DESPISE shopping for shoes or clothing! 12. I like to sleep late on weekends. 13. After sleeping late on weekends I like to sit on my porch, drink coffee and watch the birds at the feeder. 14. I don't like to talk on the phone. 15. I am an introvert although will make a complete fool of myself in a group....go figure! 16. I enjoy reading a good book while laying in the bathtub....ask my mom....all my books have "water marks" on them! 17. I once took a class and passed becoming a certified coal miner! 18. I like to drive fast. 19. I dream of living in the country. 20. I cherish friendships in my life. 21. I am a christian. (these items are NOT in order of importance mind you!) LOL! 22. I used to dream of being a photographer and took pictures daily...then life got in the way! 24. Halloween is my favorite holiday! 25. With Christmas as my second favorite holiday! 26. I am INCREDIBLY cheap on some things in life. 27. I wish I could win a million dollars so I could give it away!! 28. I have never had an entire week's vacation in my life! 29. I H.A.T.E. yard work but would LOVE to have a pretty yard! 30. I talk too much when I am nervous. 31. I am afraid of the dark. 32. I used to smoke but quit. 33. 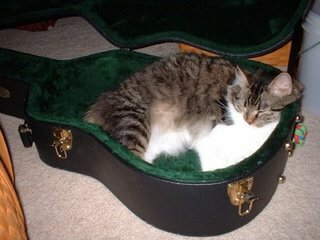 I love listening to my husband play guitar and banjo but he doesn't play enough. 34. I love my bed....I love to snuggle in bed and sleep late. 35. 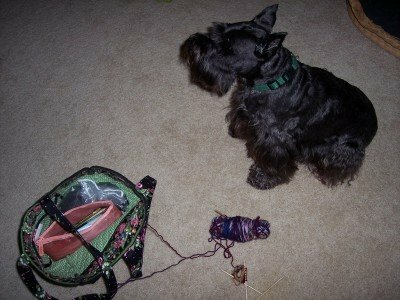 I have a miniature schnauzer named Max that I will have to be buried with when his time comes.....I LOVE my dog!! He lets me sleep in the tiny corner of the bed that he doesn't use. 36. I love being a secret angel to others!! 37. My favorite color is blue....or green....but some days it is red. 38. I am indecisive on the little things in life. 39. I am a major procrastinator on some things and a very type A person on other things. 40.I love the water....the lake in particular! 41. I love to feed the birds. 42. My favorite day of the week is Friday. 43. I like "stuff"...I'm a pack rat. 44. Speaking of which, I am DEATHLY terrified of bugs or mice. 45. I used to have two ferrets many years ago. 46. If I could go anywhere on vacation it would be Maine or Vermont in the Fall. 47. I LOVE old movies!! 48. I hate knowing Lucille Ball is no longer here......I Love Lucy.....they just don't make T.V. like that anymore! 50. I collect WAY too many things.....but I especially like baskets and pottery. 51. I have a small collection of face jugs. 52. Fall is my favorite season. 53. My favorite flower is the Daisy. 54. 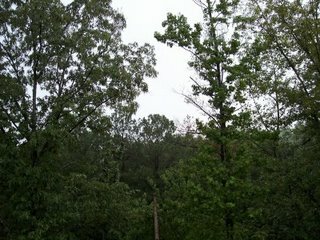 I love to sit and listen to the rain. 55. I also love a good loud thunderstorm. 56. I am ready to retire....not age wise....but ready nevertheless. 57. My family is the most important thing in my life. 58. I H.A.T.E. to exercise. 59. I love mexican food and a good margarita. 60. I like to be by myself. 61. I collect yarn.....I have lot's of yarn. 62. I am addicted to yarn. 63. Despite working in the medical field I H.A.T.E. to go to the doctor. 64. I have to have total darkness to sleep. 65. I love electronic "gadgets"....yet I am technilogically "challenged". 66. I'm scared of tornadoes. 68. I have a collection of decorative bundt cake pans. 69. I don't like reality t.v. 70. I don't like speaking in public and will avoid at all costs. 71. My husband is my best friend. 72. I love fast food. 73. I love good coffee....especially latte's. 74. I started a knitting group with my best friend. 75. My closet is always a mess. 76. I don't like to watch sports. 77. I don't like self centered people. 78. I am most proud of myself for going to school. 79. I have always secretly wanted to write a book and have it published. 80. I wish I were tall. 81. I have big feet.....EEE width! 82. I can't sing but wish I could. 83. I sometimes snort when I laugh. 84. I drink WAYYYY too many diet cokes. 85. I miss smoking when I drink coffee. 86. I have never made a soufle but have it on my list of things to bake. 87. I love to entertain. 88. I like being at home. 89. I didn't like high school. 90. I still miss my Grandmother. 91. I don't make my bed every day. 92. My most favorite place to date to work was Williams Sonoma....I love to cook and it is a cook's heaven on earth....oh and I loved the discount! 93. Favorite place I have visited is Chicago....so much to see and do. 94. I want to take a cruise to Alaska. 95. I would like to fly in a small plane....maybe take a flying lesson or two. 96. I am afraid of heights. 97. If I could chose a time to live in it would be the 50's. 98. I love Peanuts comics and videos. 99. I watch Charlie Brown Great Pumpkin and Christmas Video every year. 100. Favorite Cheesy movie is Halloween....original with Jamie Lee Curtis....which incidentally was the only scary movie I ever saw when I was growing up and I snuck to the drive-in to see it....oops......sorry mother and daddy! 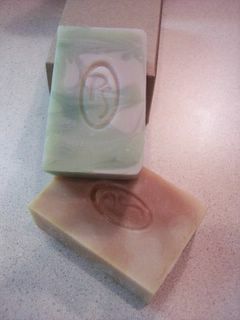 Here is a pic of the soaps Tonni made and brought to me as a gift on Saturday when we met for lunch!! Unfortunately I can't post the WONDERFUL SMELL!!! I have wanted to get into soap making for several years and may just have to get my hands into this soon!! After taking my "mini" sock class on Saturday I was so excited I didn't want to stop knitting!! I didn't get a chance to knit any following the class and decided to take my "mini" friend on a trip with me to Mississippi State University Sunday in hopes of completing my "sock education" and graduating on to a full size sock! Although I wasn't able to finish the sock I had high hopes of completing tonight!! UNFORTUNATELY Max had other thoughts!! Hard to see but he managed to pull out one needle, chewed one to a pulp and just generally made a mess.... he must have thought if he didn't actually look at me I would never know he was the one happily munching on the needle when I walked by!!!! I think the sock gods are against me!!! Blue Sky From My Kitchen! It's Blue Sky Saturday again!! I was in a hurry this morning to get out the door to Knit Noveau for a sock class and took this picture standing in front of my kitchen sink. I met Tonni for lunch following the sock class and had the added joy of meeting her sweet daughter Peyton!! Such a treat for me to get to meet them both!! Tonni brought a few of her socks for me to look at....VERY impressive stitching!! So perfect they looked machine made!!! THIS is the level of knitting I hope to achieve one of these days!! Tonni also makes soap and brought me two GREAT bars of soap.......I LOVE, LOVE any kind of bath product and I could not have been more tickled!! Unfortunately I can't post the wonderful smell of the soaps!! 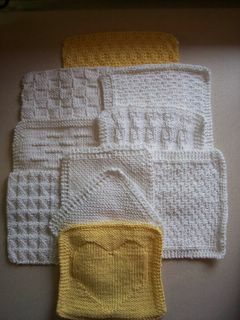 I'm embarrassed to say I don't have a craft or hobby that I can produce anything good enough to give as a gift!! Enjoyable day for me.....hope I didn't talk as much as I think I did!! LOL!!! I thought since I hadn't posted any knitting in awhile I better prove I have actually been knitting something!! Here's a few of the "warshrags" I have made lately. I have a few more but they aren't ready for their "photo shoot"just yet as their "tales" are still hanging out, and I gave one or two away last night. I am trying to deplete my "warshrag" yarn stash......I have about 6 or 8 more skeins to go and I think I'll be finished!! I'm off to Knit Nouveau tomorrow http://www.knitnouveau.com/ to take a sock class!! Yipee!! MAYBE I'll be able to learn something and get on the sock making craze everyone in the world is involved with except me!!! LOL!! I'm finally going to get to meet my first online blog buddy..... Tonni .....of Knitlog Fame http://currentobsession.blogspot.com/ We have been emailing for quite awhile and I'm tickled to have the opportunity to get to actually meet her!!! (I secretly hope if I hang out with all these great knitters some of their skill might rub off on me!) Hee! Hee! Tonni is a GREAT sock knitter among a lace knitter just to name a couple!! Princess Cupcake came for a visit yesterday and gave me a coaster she made for my desk!! This is her second finished project!! I taught her to purl yesterday.....Emily sent her some stitch markers......she is SET...can't wait to learn to read patterns!!!! Got a list of items on her "to knit" list!! 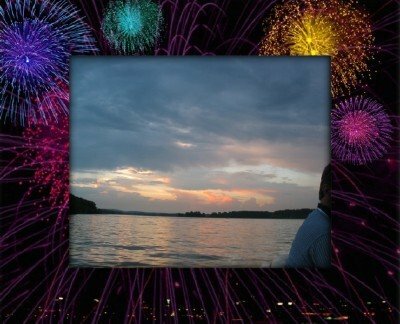 This was made last year on July 4th on our way to see the fireworks show on Lake Logan Martin!! Spectacular sunset and GREAT fireworks!! Happy to join in the Saturday Blue Sky!! Looking forward to checking everyone else's little blue part of the world!! 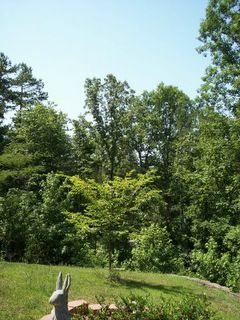 Pic shot from my front yard at 11:45 a.m. We live on a hill surrounded by BIG, TALL trees, so hard to get a shot of the sky without including trees for a bit of perspective. Started the morning on the back porch, drinking coffee, catching up on my Southern Living Magazines from May and June, blackberry muffins, more coffee, watching the Carolina Chickadees munch out on a never ending supply of sunflower seeds!! Watching the cat watching the birds...hee, hee....so close but so far away!! All this leisure activity to get ourselves motivated to do YARD work (sorry for the four letter word there!.....I know it is nasty...but nevertheless a necessary evil!). Grass to cut, weeds to pull, pine straw to spread around.....got a few plants left to plant..stacking some rocks to make a small dry creek bed to stop some erosion ....all in the glorious, wonderful 90 % humidity and high heat!! Ah....life in the south!!! What could be better???? Keeping the sweet tea handy today!!!! Talked to my Princess Cupcake earlier....she came home from the hospital late yesterday, not feeling too bad but not feeling good enough to knit.....bored to tears and wanting to know when her Aunt Darlene is coming to visit (entertain) her!!! Did manage to perk her up a bit when I reminded her that Chicks with Sticks will be meeting a full week from the time of her surgery and she should be able to travel to visit with us......she's looking forward to it already....gonna be a L.O.N.G. week! !